Most of interesting Gwyddion functions are provided as software libraries that you can use in your own programs – SPM related or not (providing that you comply with the GNU General Public License of course). Most of the functions are related to one- and two-dimensional data processing and visualization. gsvit – fast FDTD solver with graphics card support. See also gwydump which is completely independent of Gwyddion, however, it works with Gwyddion files. If you want to write a Gwyddion-independent program working with Gwyddion files consider using libgwyfile, a standalone, portable and permissively licensed implementation of the file format. If you are looking for Gwyddion replacements of old GIMP plug-ins written by Yeti, search no more. Threshold-example is a sample non-trivial (with a GUI) standalone module that can serve as a base for your modules. So it is not a separate program, it lives inside Gwyddion and is invoked from within Gwyddion. The module compiles both on GNU/Linux and cross-compiles for MS Windows. Please see the included README file for detailed instructions. Only the source code is provided as the module is not particularly useful as a data processing tool. Its point is to demonstrate how to build a standalone Gwyddion extension module. 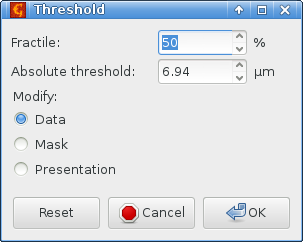 Screenshot of threshold-example module dialog. gwybatch is a quite simple standalone SPM batch data processing program written in C using Gwyddion libraries. It is command-line oriented and it does not anything very useful as-is, however, it shows how to load, process and save SPM files and you can replace the data processing part with something more interesting. See also the source code diretly in the Subversion repository. gwyiew is a quite simple standalone SPM file viewer that makes use of Gwyddion libraries. Its primary purpose is to serve as a comprehensible example – its source code has only slightly over 200 lines. 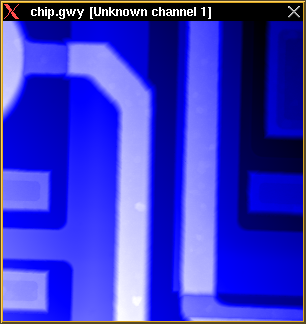 It can display any SPM file Gwyddion can (except raw and pixmap files that have to imported manually to Gwyddion) and it supports multiple channels even though it only displays one at a time – use PageUp/PageDown to cycle through channels. Screenshot of gwyiew showing a sample data file.